Imported from andrea.editthispage.com, a Manila site, on Sep 20th, 2005. Two hours, twenty-eight minutes and one second – that is how long it took me to skate 42.195 km today. Good thing the marathon started so early (9.10 am), or it would have been unbearably hot. I crossed the finish line before it got real hot after noon, and I’m thrilled with my time. During training, I managed to skate this fast only once or twice, but that was for 20 km and in cooler weather; I never imagined that I would be able to do this for the whole marathon! I have great respect for the inline-skaters who managed to finish in about half my time, and I’m determined to do it faster next year. You can already register for the Mittelrhein-Marathon 2006 on June 18 (my 31st birthday). Photos of today’s Marathon will be available at Finisherphoto on or after June 25th. This entry was posted in Archive on June 19, 2005 by Andrea. Yep, it’s true, today is my birthday. Thanks, Hal, Susan, Cathie, Garret and Scott! It’s also Sheila‘s birthday today, so happy birthday, Sheila! However, the real big day for me is tomorrow because tomorrow is Mittelrhein-Marathon day! I went to the Marathon fair yesterday and got my number and a chip for measuring the time. There are going to be about 1300 inline skaters and 9614 participants altogether. Translations: Low temperature, high temperature, weather in the morning, afternoon, evening. And for those of you not familiar with the metric system:: 30°C is 86°F. “magnetic forces combine with physical dexterity and strategic thinking […]. Enter a new dimension as you learn to wield the invisible forces at play on the board. Force your opponent to disrupt the magnetic traps you have set – setting off dynamic chain reactions as pieces flip and collide – allowing you to score points to win the game! A unique board game for 2 or 4 players, Polarity is easy to learn and very exciting to play over and over again. Casual players enjoy the exciting game play, and more advanced players prize the depth of strategy that can be employed. We haven’t played it yet, but I played around with the magnetic discs and tried some of the moves. The website provides more information and examples of possible moves that are not mentioned explicitly in the rule book (of which I’ve got the German version, obviously). I predict that we are going to have a lot of fun with this game! This entry was posted in Archive on June 18, 2005 by Andrea. This weekend André and I had time to explore our new (as in: we moved here almost a year ago) surroundings a bit. 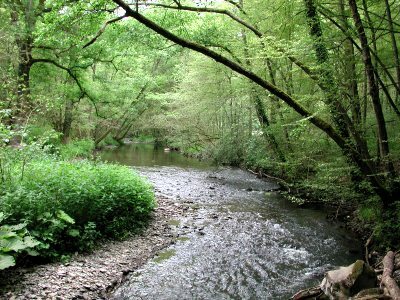 We decided to visit Burg Eltz (Burg means castle), but to take the long(ish) way there, along a little brook which is also called Eltz (Eltzbach). 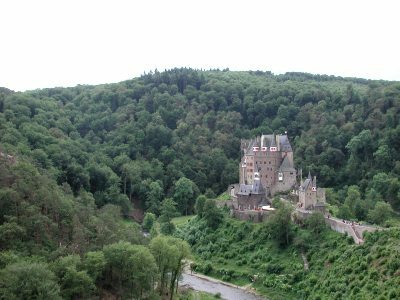 About ten kilometres upstream from Burg Eltz is another castle called Burg Pyrmont, and we started our hike in the middle between the two. 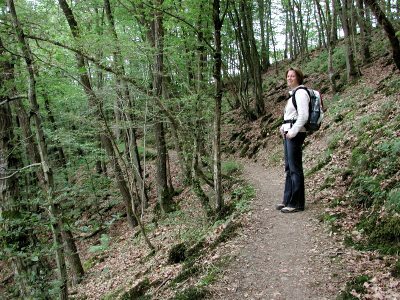 I guess our next hike will have to be the other half of the trail and a visit to Burg Pyrmont. … we prefer taking another shortcut. 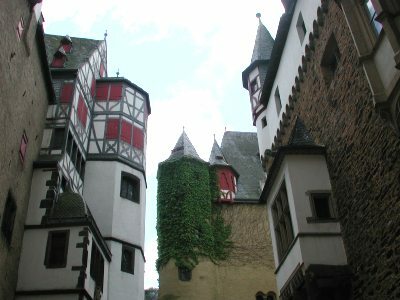 The Eltz, viewed from a bridge. 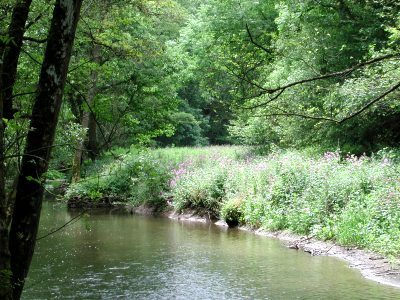 Wild flowers grow next to the Eltz. 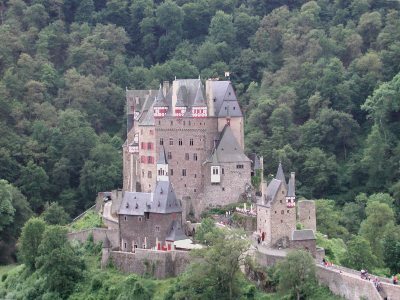 This is the view of the Eltz castle you’re greeted with after hiking the Eltz valley. Getting closer to the castle. 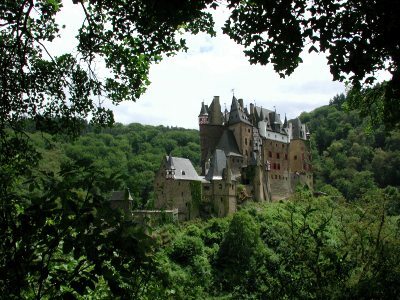 The Eltz castle is situated in a picturesque little valley and almost completely surrounded by a loop of the Eltz brook. 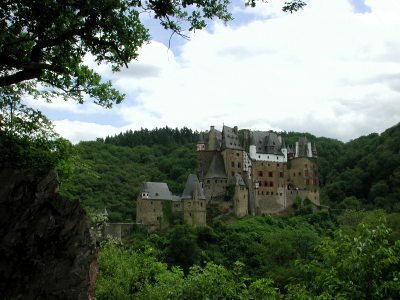 Another view of the castle from the other side. The castle up close and personal. It looks like something out of a fairytale, only less kitschy and more real. 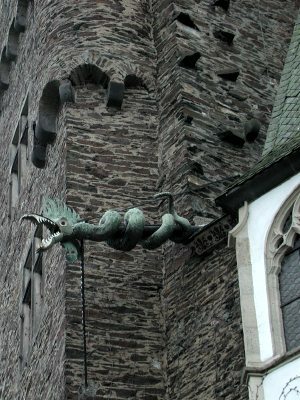 A spigot on the outside of the castle. 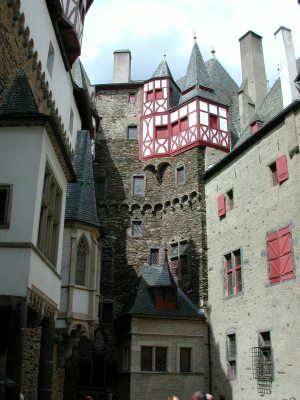 The inner ward of the castle. Another view of the inner ward, which is surprisingly small. Looking up to the castle from the valley. 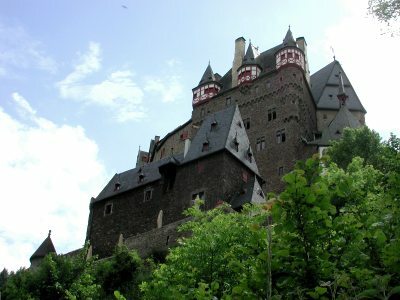 For more information on the castle, visit Burg-Eltz.de, which is available in English and German. 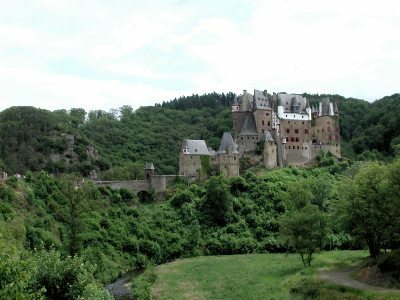 Or visit Ingi’s page about Burg Eltz (text in German, but interesting photos). This entry was posted in Archive on June 13, 2005 by Andrea. As promised yesterday, I uploaded and linked the rest of the photos from our trip to Berlin: day two, day three, day four. And once again, if you prefer all the photos without text, click here for the slideshow. Forgot to post this link yesterday: A couple of days ago, there was a thread on MetaFilter I found interesting, of course mainly because of the link and the book that’s linked: Feynman’s letters. The Guardian had an article called ‘This is how science is done’ which quoted a few of the letters. More are available in the book called Perfectly Reasonable Deviations from the Beaten Track: The Letters of Richard P. Feyman in the US or Don’t You Have Time To Think, The Letters of Richard P. Feynman, edited by Michelle Feynman, his daughter. The American edition seems to be out already, the British one is to be published on June 2nd. Thanks to the weather that finally feels like spring again after lots of rain and cold, today’s postings are brought to you live from our balcony. Not quite a year ago I dreamed about websurfing on the balcony – now it’s a reality! This entry was posted in Archive on May 19, 2005 by Andrea. I recently discovered that all the photos were gone from our trip to Berlin because I had uploaded them to the server at the University. I’m in the process of re-uploading those photos and changing the links to the photos right now. The first page is done and the rest will probably follow tomorrow, but if you like you can see all 88 photos as a slideshow. Enjoy! The signs say “Polch 4.4 km” and “Ochtendung 5.6 km”. “7.5 km Wendepunkt” – there are markers every 2.5 km along the way. Die letzten beiden Bilder sind extra für Dich, Jörg! 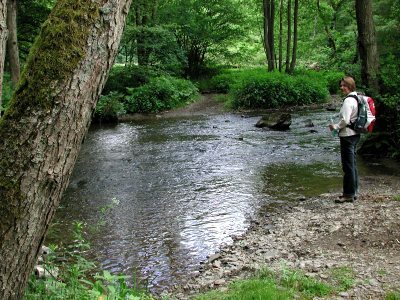 It’s a pity that you can’t really see in these photos how beautiful the surrounding landscape is. I think I’ll have to go there again with my proper camera on a nice day and take some real photos. And in case you were wondering how my training is coming along: I try to skate two or even three times a week, at least 20 km each time. I’m not really getting any faster, but get less groggy after training, so I guess that’s something. I’m aiming for finishing in under three hours, and anything near two and a half would be marvellous. However, I’m afraid that we will have headwind along the Rhine, so I’m not really sure if I’ll be able to skate as fast as I do during training. Obwohl ich meinen Beruf sehr mag, gibt es etwas, das ich nicht sehr gern tue, und das ist Korrigieren. Mir ist bewusst, dass ich mit meinen Fächern da noch gut dran bin, da man in Mathematik in der Regel klar entscheiden kann, ob etwas richtig oder falsch ist, und eine Punktewertung verwenden kann. 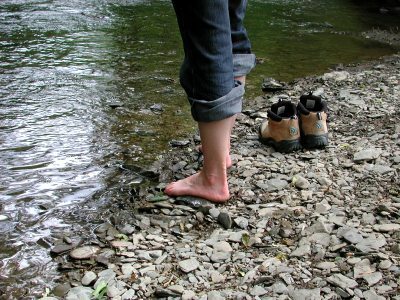 Physik ist in der Mittelstufe “nur” ein Nebenfach, in dem Fach gibt es also nur in der Oberstufe Klausuren und ansonsten schriftliche Hausaufgabenüberprüfungen und Tests. Meine Strategie: Nach Möglichkeit alles am Stück korrigieren, zumindest bei den Arbeiten in höheren Klassen aufgabenweise. Bei den Kleinen in der Fünf sind die Arbeiten noch so kurz, dass man auch beim schülerweisen Korrigieren noch den Überblick behält, wo man wofür wieviel Punkte abgezogen hat oder wie man bestimmte Kleinigkeiten handhabt. Schließlich soll ja alles möglichst gerecht korrigiert werden. Und da fällt mir ein: Jetzt muss ich noch eine Mathematikarbeit zuende planen, die ich übermorgen schreiben werde. Damit ist die Beschäftigung am Wochenende dann gesichert. This entry was posted in Archive on May 18, 2005 by Andrea.